McGolf Full Swing Simulators are finally here! Combining state of the art technology and a sleek design, Full Swing Golf's S8 Model includes a patented tracking system with infrared/ion2 vision technology which creates optimal accuracy and reliability. Full Swing specializes in cutting edge golf simulation technology. The technology features state of the art ball tracking and offers clients 93 Championship Courses. 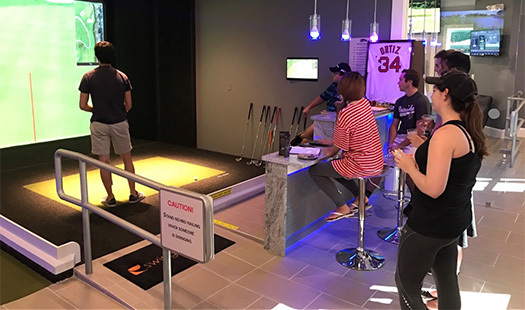 Full Swing Golf, found in over 60 countries worldwide which optimizes the player's experience with its real time environment. The technology can be found in the home of PGA TOUR Player's including Jordan Spieth, Ian Poulter, Bill Haas, Hunter Mahan, Mark Wilson and Tiger Woods. Simulators must be booked three hours in advance. Full Swing Promo Video 2017 from Full Swing Golf on Vimeo.